Lizzie Gill is a mixed media artist whose work explores themes of retro Americana in a contemporary context. Through a variety of mediums, she illustrates a time warp, composed of everyday life, human agency and “post feminist” contemporary society. Conceptually, she explores how the modern approach to romance has evolved along with technology into the form of online courtship. 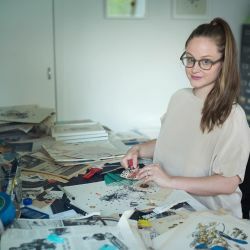 She finds inspiration in the idle pursuits of romantic digital interactions such as texting and dating apps when juxtaposed with images of marriage and love from 1950’s advertising and publications. Her work is a nostalgic look at both the American past and innocence with a twist, prompting one to question their sense of time and culture. Gill has participated in a number of group shows in and around New York City as well as abroad. She lives and works in Brooklyn, NY.